OLED, otherwise known as Organic Light-Emitting Diodes, have long been lauded as the future of televisions. After all, they offer up a richer color gamut, deeper blacks, faster response times, wider viewing angles, and better power efficiency. That's a lot of heady promises but after laying my eyes on LG's 65-inch EG9600 curved 4K TV at an LG event this week, I'm starting to see the appeal. For starters, the display is absolutely gorgeous. With the 65-inch EG9600 pushing 3,840 x 2,160 pixels, the 4K TV's extremely high-resolution by itself is stunning. You can discern so many more details, from the tiniest star in the night's sky to the microscopic pores on a mushroom. OLEDs are also amazing in their own right in their ability to produce much more contrast. Whereas traditional LED screens require an external light source to backlight the display, an OLED panel is emissive, meaning it acts as its own light source. As such each individual pixel can switch off and turn completely black. At the same time, an OLED display can be much brighter than a panel lit by LED bulbs. Ditching the always-on backlight allows OLED TVs to produce higher contrast image, in which you can see a greater difference between the brightest and darkest pixels on the screen. LG also employs another piece of tech called single pixel dimming to make sure none of the illumination on the screen bleeds into itself. This in turn plays into the EG9600's ability to produce a wider color gamut with more accurate hues to boot. OLED TVs aren't just a boon to living room: this still nascent panel technology is proving to be a game changer for the production of TV shows as well. Matt Lloyd, the director of photography for Marvel's Daredevil, was overjoyed to show a few early clips of the new Netflix original series, debuting April 10, at the event. As the scene opened to a barely lit apartment on a dreary, rainy night, Lloyd explained that the Daredevil team was afforded full artistic freedom to shoot the show as they envisioned thanks to OLED. "What's gone on in TVs for far too long is we've been forced to work to the lowest common denominator," Lloyd said, explaining that he would often lower the contrast and dynamic range of his videos to better suit the quality of CRT and LCD TVs. "Generally the way it goes for me in 'network' or 'studio' mode production, when mastering an image, you shoot it, [the] dailies are great, super moody and stylized. We love it," he said. "[We] get to the grade, I spend a day with my guy and we color the entire show and everything is great and then invariably [we're told] everything is too dark, [and] we have to go back in and redo it all." With Netflix, however, Lloyd was given the freedom to shoot every scene as he envisioned, and he could expect it to display properly on OLED screens. "This was a scene that the director Phil Abraham and I determined should be incredibly dark," Lloyd quipped, referring to a shot of dimly lit and narrow hallway. Lloyd said he was told the scene needed to be so "irresponsibly dark" that they would have normally been fired for filming it. Lloyd alluded to how he can film things differently because of OLED screens, allowing shadows to fall off, and expecting to see the stripes on the back of an extra's shirt. "All the layering of the density and the complexity of the lighting, it's not voodoo or magic. It's just knowing you going to reproduce everything on the backend," he said. "Every venue that I go to where I have to present work, I'm in there tweaking the [TV] settings, brightness curve, and everything. This [OLED TV] is just the viewing standard right out of the box." It truly is astounding when you think about an image that represents absolutely everything from the purest form of white to absolute non-existent density or luminance. A lot of lighting instruments are in play here […] and knowing it's going to come out like this is incredibly empowering." 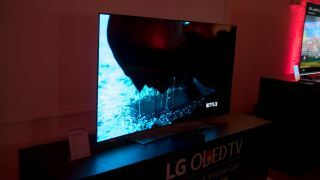 Of course, such a pretty picture comes at a heavy price, and the LG 65EG9600 is one expensive TV: it costs $8,999 (about £6,122, AU$ 11,701). Comparatively, the LG offers an traditional LED 4K set, named the 65UF9500 that costs roughly half as much with a $4,499 (about £3,060, AU$5,850) price tag. OLED's biggest obstacle to becoming a mainstream television technology is that it's always been prohibitively more expensive to produce. In fact, LG is one of the remaining few companies that still produces OLED televisions.Sony, Panasonic and Samsung all dropped OLED to pursue more refined LED panels and 4K technology. The image quality improvement you get out of an OLED screen is dramatic, but it's still too hard to justify the exorbitant price that could normally get you two or more television sets. However, after seeing the stunning beauty of such a screen I hope they don't fall into obsolescence like Plasma TVs.